One of the most important variables in mountaineering is weather. Particularly so in the Philippines, whose tropical setting gives rise to a number of weather disturbances. In 2007, nine typhoons struck the country, from May to October. A significant proportion of mountain-related accidents occur during typhoons. Aside from large-scale phenomenon, there are focal weather-related events that may pose risks for climbers. In some mountains such as Mt. Pinatubo, the outcome is predictable: you can get stranded because of lahar. In others, such as Mt. Makiling, a sudden flash-flood is unpredictable and can sweep away everything in its path. This has happened in the 1990s: picnickers at Flatrocks were afflicted by a flash-flood and their bodies were later discovered floating in the brooks at UPLB campus. With this, it would appear that November-April are the best months to climb. The above pattern, however, cannot be used as a guide. An important feature of tropical weather is its focal variability – that is, (1) small areas of rain; and (2) volatility – it can be raining now but it may be sunny after an hour. Thus, mountaineers must always prepare for all weather conditions. However, weather outlook must still be an important consideration. 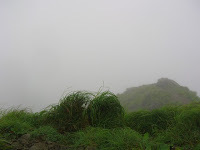 It is more difficult to trek during rain; a very hot day can also make a trek arduous especially in exposed environments. Also, phographers, astronomers, and those simply looking for a nice view would want to rethink their climb if the weather outlook says its gonna rain. An example is the photo shown here — this was taken at Pico de Loro but the parrot’s beak is nowhere to be seen! On the other hand, waterfalls become grander during rain, and water sources are replenished. Others hold it is less tiring to trek during rain. It’s virtually a personal choice! Recognizing the importance of weather, PinoyMountaineer has begun installing site-specific weather outlook and forecast for each mountain from Accuweather.com — wherever possible. Fortunately technology has enabled us take information-gathering one step further, and so we must utilize this to make the website more convenient and informative. It must be mentioned as a disclaimer, however, than weather forecasts are not always accurate. It is just meant to be a guide, but when it says “Sunny”, that doesn’t mean you’ll leave your emergency poncho behind. Also, in each blog entry, under “Special concerns”, weather concerns are discussed. You may want to check whether (1) trail exposure to sunlight; (2) geographic predispositions to strong winds such as coastal location; (3) site-specific hazards such as landslide and flashfloods; and (4) the possibility of hail showers and frost. In general, waterproofing of valuables and clothes is alawys advised. Ziplocks would come in handy, as well as garbage bags. of course, it would be best to have waterproof equipment but one can always improvise. Sunblock of at least SFP 15 is sufficient to protect against sun damage. By the way, ultraviolet waves penetrate the clouds you should still wear sunblock on a cloudy day. 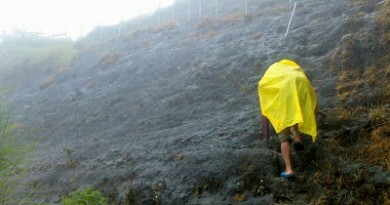 Some mountaineers bring umbrellas for both sunny and rainy extremes. There will be times that heat will be generated, or made worse, by humans. The picture on the left is that of Mt. Iglit in Mindoro. 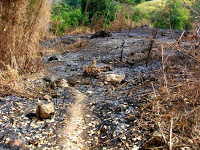 It was scorching hot but what made the trail worse was the kaingin (slash-and-burn) practices which charred the grasses. We felt like we were on an oven! In case you happen to be on a mountain during a supertyphoon hit, don’t panic. Stay away from rivers and streams. Stay away also from tall trees which are likely to be fell by the winds. Use the mountain to your advantage by using its slopes as barriers to the wind, but don’t stay in slopes that are likely to be eroded by heavy rainfall. Prioritize making yourself warm and dry, and be patient: weather could only improve. Bottom line? Always check your weather. If you’re all set and suddenly a typhoon is headed towards your destination, it is best to be on the safe side. A good mountaineer not only knows how to climb, but when to climb. And when not to. To end, mountain weather is, to use a figure of speech, as unpredictable as the weather. It won’t hurt to always be prepared. 6 Comments on "Mountain weather"
Thanks a lot for the info. Im looking forward to that day. I'm getting excited! to cam: warm greetings to the TMC! a makilala-kidapawan or a kidapawan-kapatagan would be great. the trails are all unique — kidapawan with its river crossings; the davao trails with their bouldering etc. the important thing is to use any two trails to maximize the experience.you don't have to bring medical certificates. expect a lot of campers at the summit area since its april… i had problem finding butane in kidapawan: your best bet would be the malls of davao (gaisano, SM). i wish the TMC an enjoyable mt. apo climb. please update us! Hi, I and my friends from Tayabas Mountaineering Club(Quezon province) are planning to visit Davao on April 21-26, 2008 to climb Mt. Apo. I would like to solicit some advise. We're planing to use 2 different routes during ascent and descent, what trails would you suggest (Kapatagan, Makilala-New Israel, Kidapawan, Magpet-Bongolanon, Calinan-Tamayong)? Do we have to bring a copy of medical certificate as a requirement to be given clearance and tour guide? Can you recommend a store where I can buy butane gas (campingaz, iwatani, or kovea)? Any info will be highly appreciated. Thanks. thanks for your suggestion! unfortunately i don't have enough info yet to make such an article. but we'll see how we can do it in the future. cheers! may i suggest that you also write an article about the most reliable brands of outdoor products (jackets, sleeping bags, shoes, tents, packs and other essentials) here and abroad? and probably include shops/places where one can find cheap but genuine/efficient products. kudos!